Please do not send submissions for now. We may be able to reinstate it at a later date. You don't have any dragon bookmarks? No problem, just make one yourself! The bookmark on far right on the picture below is a handmade one. Somebody has cut out dragon pictures and glued it on a green card. We found it in an old book. You can, of course, make your own illustration to create a dragon bookmark. No limits for creative minds! 1. Only bookmarks showing dragon images will entitle participants to get raffle tickets. 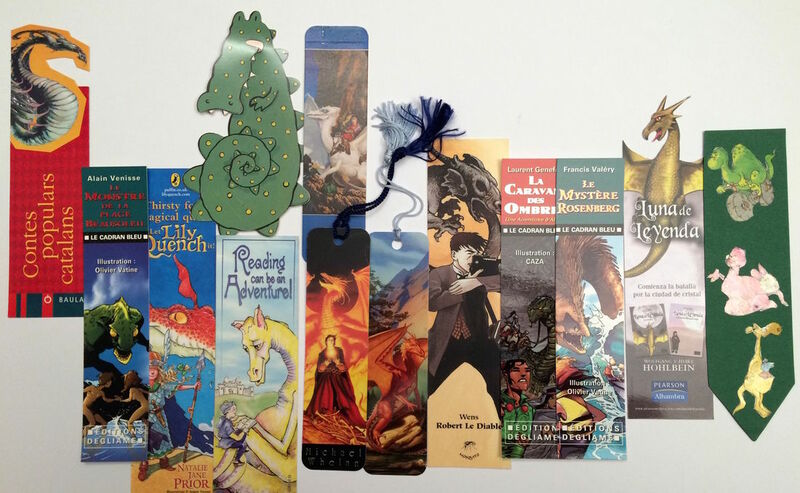 Browse your collection to find some dragon bookmarks and please be aware that dinosaurs are no dragons, sorry. 2. Send your bookmarks to the following address: SUSPENDED - DO NOT SEND ENTRIES FOR NOW! Don't forget to write your email address, your postal address and a lucky number between 1 and 99. The shipping costs for sending your bookmarks to us is covered by you, and we are not liable if your bookmarks get lost in the mail. The shipping costs for sending the raffle pot bookmarks to the winner by recorded priority airmail letter/parcel is covered by us. 3. Players will get 5 tickets for each bookmark that has no doubles in the raffle pot, and only 1 ticket for a bookmark if there are doubles of it in the raffle pot. This means you should study the pictures of the submitted bookmarks and try to avoid sending doubles of already submitted bookmarks to get more tickets for your bookmarks. This rule is meant to help to build up a unique dragon bookmark collection for the winner. Of course, your chances to win are higher the more tickets you have. t = (10 x 748) / 257 = 29.10506 - 29 = 0.10506 x 257 = 27 Ticket number 27 is the winner of the raffle in this case. There is only one exception in the calculation: if the calculation gives 0, then the highest ticket number is the winner, in this case ticket number 257. Well, this sounds rather complicated, however, it is completely verifiable and there is no chance of manupulating it by anybody. The lot is drawn by the participants themselves so to speak! Thus, all participants should send along their bookmarks also an individual lucky number between 1 and 99. 5. The winner will be determined on 12 August 2017. Bookmarks arriving after this date cannot join the raffle, sorry! So please send your bookmarks in time. A player can send several lots of bookmarks on different dates. This may be helpful in cases where players might discover new dragon bookmarks after their first shipping. 6. At the end, there will be a second winner as well. The second winner is the player next to the winner in the player list sorted by the joining date. The second winner will get the bookmarks which the winner of the raffle has submitted. This rule avoids that the winner is getting her/his submitted bookmarks back. The second winner might also receive some extra bookmarks donated particularly for the second winner. 7. Dragon bookmark donations for the raffle are welcome. In our last raffle we had a high percentage of donated bookmarks. Bookmarks can be also donated explicitly for the consolation of the second winner. In this case, please declare your donation as such. Thank you to all donating supporters in advance! That's all - good luck to all participants! Our sponsor Maner Consulting has donated 13 dragon bookmarks on 1 April 2017. We have now 13 beautiful dragon bookmarks in the raffle pot.